Let's start this post with a disclaimer: should there be any misspellings, incorrectly linked items, or other errors, I blame: WEDDING BRAIN. Because I'm getting married in 11 days!!! 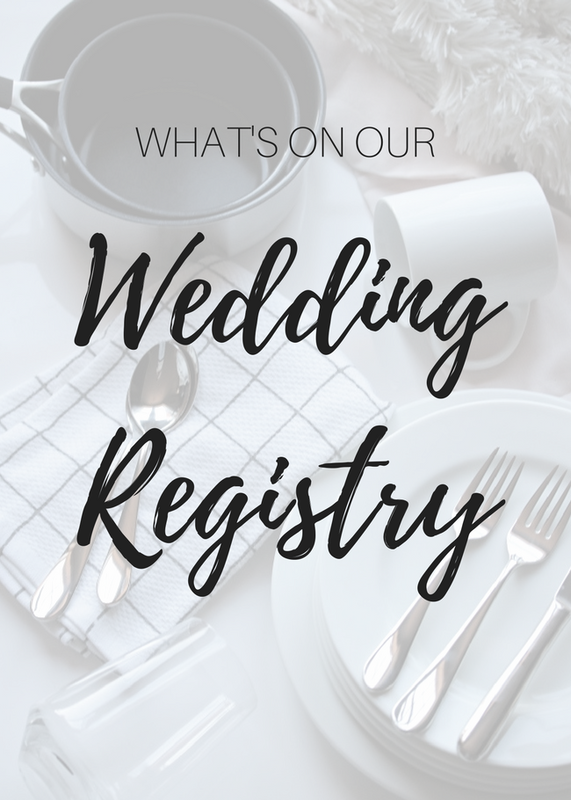 I'm so excited to share with you a list of all of the things we registered for as a soon-to-be-married couple! The wedding registry was something I hadn't put much thought into ahead of time, mainly because we have lived together for over 3 years, and already have an established household. Also, I consider us to be more "minimalist" than not- so the idea of signing up for tons of stuff freaked me out a little, and I kind of contemplating not registering at all. After taking a breath and deciding that registering online sounded way more appealing (to me) than going in-store, I realized there were actually many things that I would love to replace in our home. Mainly, these were things that I was gifted or purchased almost 10 years ago when I moved out of my parents' house. Now that we've been receiving things in the mail from our sweet, generous friends & family, I am so grateful for the opportunity to have a fresh start with beautiful new things in our home- and to add in some things that we really did need! I decided to make a more comprehensive list than what we actually registered for, because I wanted to be sure and cover some of the must-haves that we already have in our home that I would recommend that you guys register for! And even if you're not getting married any time soon, or already are, I hope this list will be helpful in giving you an idea of what's around our home & what I would recommend that you get too. I've listed the items that we actually registered for in bold for your reference. Also, there are affiliate links in this post! If you purchase through them, I receive a small commission which supports me & keeps my blogging up & running. A couple of my non-expert tips for registering: register at places that have lots of options, and register for things at a variety of price points! That's a big list, I know- but use it as a guide & go through and pick out the things you really need & know will be a useful addition to your home! I hope this was helpful, or at least fun to check out! And if you're a visual person, have a peek at this nifty image list I put together! Not all items are included, but it gives you an idea and allows you to see how everything looks together. All are clickable!